The first cryomodule for the new MESA accelerator will be delivered in early March. Kurt Aulenbacher and his team were able to visit the manufacturing center and take their first look into the heart of the new MESA accelerator. The new cryomodules are nearly three meters long, weighs ca. 1.5 tons, and has an acceleration field of 12.5 MV/m. The modules will become the heart of the particle accelerator MESA (Mainz Energy-recovering Superconducting Accelerator), which is currently under construction. The two “cryos”, as members of the PRISMA Cluster of Excellence are calling them, are being built by a special manufacturer in Bergisch-Gladbach. During a visit to the production center in early February, Kurt Aulenbacher and Florian Hug from the MESA team were able to take a first look at them. “It is pretty amazing to see the modules almost ready to be transported after the long planning process,” says Florian Hug, a junior professor for nuclear physics at the institute and part of the MESA team. He is standing together with Kurt Aulenbacher, the team’s lead scientist, in front of the new module in the production center. Every module contains two acceleration structures that will give the new particle accelerator MESA a field gradient or energy recovery per revolution ten times higher than the current accelerator MAMI (Mainzer Mikroton). Superconductor technology will keep energy loss to a minimum. Using the new cryomodules, MESA will be able to produce a much higher radiation intensity. After their arrival in Mainz, the cryomodules will spend several months undergoing testing in the Helmholtz-Institut Mainz (HIM). “It will be an exciting day when the pieces are placed into the accelerator”, Hug says. MESA construction is planned to be finished in 2020, coinciding with the completion of the new PRISMA research building. Once it is built, Johannes Gutenberg University (JGU) will be the only university in Germany running a superconducting energy recovery linac (ERL) in an accelerator of this size. Currently, only the normal-conducting ERL at the Budker Institute in Novosibirsk (Russia) is available for experiments with photons. Additionally, here are several trials for superconducting, multi-turn ERLs with high radiation intensity. Until recently, superconducting ERL technology was used successfully in Daresbury (UK) and at the Jefferson Lab (USA) for the production of photons. When MESA begins running, it will be the first ERL built for nuclear and particle physics. 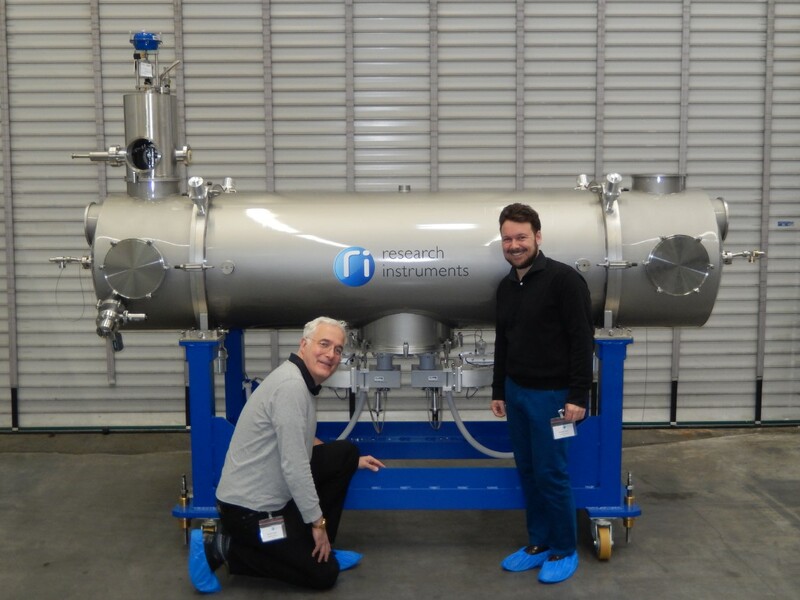 Kurt Aulenbacher und Florian Hug (fltr) are inspecting one of the new cryomodules for MESA.